I enjoy creating landscape quilts! 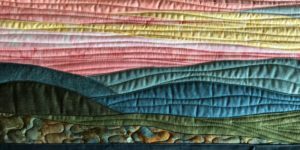 Often my sunset and sunrise art quilts have a fore gound of hills or mountains. My landscape tree quilts frequently have a background of hills or mountains. These sections of the quilt are not dominant and often small in area but they create some quilting challenges. I’m never sure how to quilt with my free motion designs so I’ve been experimenting. I try to select fabrics which create depth, color and encourage you to imagine these really are hills or mountains, that is, convey the character of this landscape feature. Once your select fabrics though, you are halfway done with your task….how to quilt is something I puzzle over with each quilt. I’ve included some photos from several quilts which show a variety of approaches. Sometimes I’ve used a simple stitch design of minimally wavy lines in varied patterns. Sometimes I quilt very minimally and let the fabric speak for itself. If I’m trying to create more depth in the mountains, I often use a very tight stipling stitch for the mountain/hill section furthermost away. I’ve been experimenting with a flame like design stitched horizontally and I like that effect. You can see these different options and a few more in the photos with this blog. I also included a few photos of the back of one quilt where the stitching is easier to see. As with all contemporary quilting and art quilts specifically….there are no rules!! You can try anything you like when quilting your landscape quilts. Be adventurous and try sometime new!